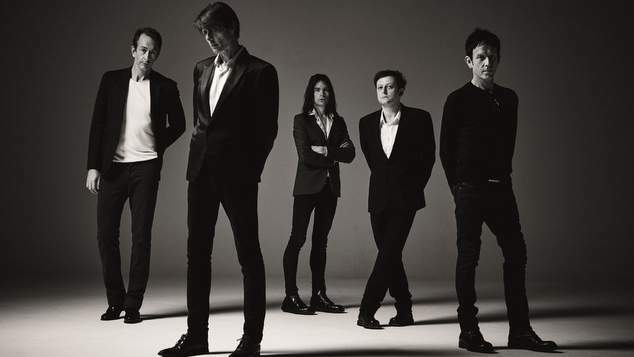 British rock band Suede are set to release their eighth album The Blue Hour on 21st September. It’s a luscious mix of dramatic tunes which see the band bringing in orchestral elements and working with acclaimed producer Alan Moulder. In the early 90’s they were dubbed ‘The Best New Band in Britain’ and released five albums of swooning rock ‘n roll. The band also challenged the norms about sexuality with lead singer Brett Anderson talking about bisexuality, he famously said he was a bisexual man who was yet to have a homosexual experience, and drummer Simon Gilbert came out as gay at a time when most out-and-proud musicians were in the realms of camp pop. In 2003 the band split up, but after a decade away from the limelight, they reformed and got back to putting out amazing albums of songs. OUTinPerth chatted to Suede’s bass player Mat Osman. As our chat occurred as Australian politicians were making world headlines for ousting yet another Prime Minister, we started by asking Osman if her was available to lead the country. Are you available to be the next Prime Minister of Australia? I think everyone gets a go at it nowadays, I’m willing to give it a go, I’m a bass player in a rock n roll band I have free time. You have an economics degree. Yeah I’m probably over qualified. Australia’s got a lot of sunshine, I’ll give it a go. Have you used your economics degree since you went to university? God no, I went to university for… I’m so old, this is back in the days when you could get a grant to go to university, you didn’t have to pay. So it was just a way of spending three years in London going to gigs, going to clubs and stuff like that, and meeting people. I’ve not used a single minute or skill of it in the thirty years that followed. Tell me about the new album The Blue Hour, did you have specific goals to achieve when you headed into the studio? Yeah, I think we’ve been traveling down a path with the two albums before making meandering kind of whole-albums where you listen to all the tracks together, and it’s really the culmination of that. It’s long and it’s not packed with radio singles, it’s supposed to be a dark, knotty, complicated album. It’s something that exists as one thing. It’s got a little story running through it, it as has spoken word pieces and these interstitial pieces that are field recordings. It’s supposed to be a totally immersive old fashion album. It seems hard to keep people’s attention now, I see a lot of bands putting work out on cassettes because it makes people listen. All of this kind of stuff, especially with the last record we knew we wanted to make something that was completely unlike that. We wanted to make something that you sat down and listened to from start to finish. I think we thought we were going to be doing something that is wildly unpopular but the weird thing is I think it was our best received record for twenty five years. The reason people love it is because of all those very unmodern things. You have to dedicate time to it. It’s not obvious, it takes a second listen and a third listen to get into it. It was a real moment for us, the reaction to it. It was something we thought we’d done almost for ourselves, but it turns out there are hundreds of thousands of people who felt exactly the same way. It’s one of the reasons this new record is extremely that way, there’s lots of long songs on it and it’s quite dreamy, that’s because we realised there were people who come with us that journey with us. Increasingly there’s a lot of strings and orchestra that are part of the Suede sound. It’s interesting, we’ve used them since day one. When we felt that stuff need it, but for this record, right from the start I think we just wanted to push things as far as they’d go. So the big songs are bigger than we’ve ever done, and the small songs are tidier. It’s a case of taking Suede to the end of the road, as far as you can making this kind of record. We went over to Prague and worked with the Prague Symphony Orchestra. What was it like working with Alan Moulder? It was great, it was really good. He’s been on our list of people we wanted to work with for years and the funny thing is he lives two streets away from me, his studio is a five minute walk away – which I had no idea about. Ed Bueller who normally produces our records was in L.A. and we wanted to do the record in Britain, because it is a very British record. Literally we didn’t ask anyone else, Alan was top of the list, apart from Ed being first. He makes things sound really good, and yes I know that that’s the basic thing for a producer, but he makes guitars sound really good and there’s lots of guitars on the record. He’s not one of these producers who talks about arrangements a lot. It’s about making it sound tough and big, and emotional. I loved it. Do you still enjoy the experience going out on the road and touring? I really do, it’s one of the great great things to see how what you do affects people. I don’t think i could do something like being a writer where it’s all very internal. I love see the crowd bounce up and down in front of you. It’s where the songs come to life. You always learn what the songs are when you play them in front of a load of people, You see how they affect people, you find out which ones make them move and which ones make them cry. I love it. When Suede first arrived there were copious news articles about the band and members made statements about sexuality and sexual fluidity, when we look back on that now, we realise it was actually quite groundbreaking. Yeah, the funny thing is – it didn’t feel groundbreaking. When we started, if you made music in London then you’re part of the gay scene, because that’s where music breaks in London. They were always the first community to get interesting bands, they were always the first community to start interesting clubs. If you came to London culture was sort of half-and-half gay and straight culture. All we wanted to do was be really inclusive, what we’re just singing about the big emotions, love, fear and loss – the effect for everyone’s the same. It didn’t feel groundbreaking to say these songs are for everyone. We’ve always involved ourselves in gay rights issues, but the simplest thing was just about trying to make something that touched people and not caring about who those people were. It didn’t feel like we were being groundbreaking it was just us representing the world we were from. It was probably quite different for us here on the other side of the world where homosexuality wasn’t decriminalised until the early 1990’s to suddenly have a rock band who included gay people. Yes for sure, for us though we just inherited a world that was created by groundbreaking artists people in London. People we worked with like Derek Jarman and the Pet Shop Boys and places like Heaven and The Underworld. It’s part of London’s artist DNA, to be homophobic in the arts scene in London would be idiotic. We were supported so much by the gay community and the nightlife scene, the clubbing scene, it felt incredibly natural to us. What was it like for those years when the band split up, did you think you’d never return? Yes, I was done with the music business, I thought the music business was this terrible shark pool of indecency and viciousness, but then you realise that all industries are like that. It was a really good thing for all of us to have time away from all of that. I spent a few years working as a journalist and other things, I write for the The Guardian and The Independent and do a lot of travel writing which I enjoy. We’d never really done anything apart from being in a band, we’d never done anything apart from being in a successful band. It was eye opening, we took a lot for granted., and when we came back we were very aware of how fragile it is and it’s special. My favourite moments in the studio and my favourite live moments since we came back are when you just feel it’s all made of glass, and it could shatter at any second, and I didn’t really feel that at twenty five. Suede’s The Blue Hour is released 21st September.